Yes, beet pesto is totally a thing and it's not only gorgeous to look at, this recipe is totally delicious. You basically make pesto the way you normally would (basil, pine nuts, garlic, parmesan) then blitz it with roasted beets to toss with linguini. While the beets roast, add some summer squash to the pan for your vegetable side. The result is a vegetarian pasta main that is the most amazing fuschia color. If you twirl the strands just right into bundles, they look like pink flowers. This is one of those dishes you'd want to stare at all night long if you weren't dying to eat it. Gluten free? 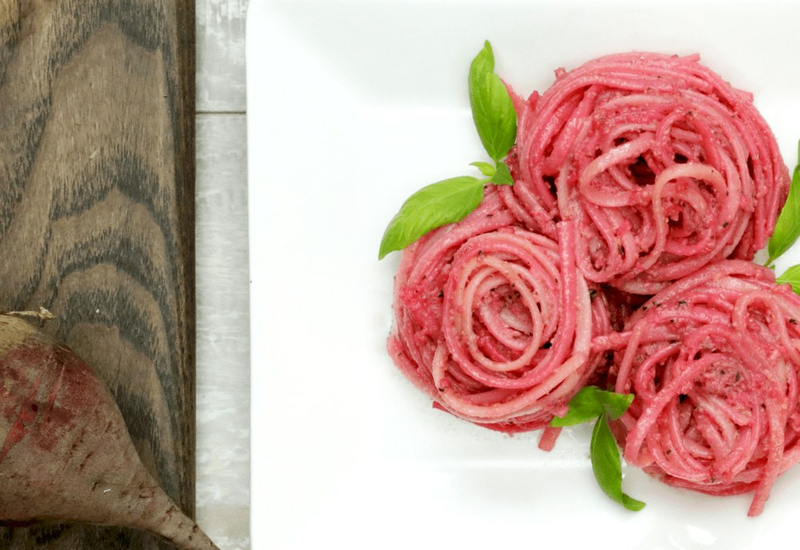 Serve the beet pesto over your favorite gluten-free pasta. You could also serve the beet pesto as a dip to have with crackers or toasted baguette slices. It's also terrific as a spread on sandwiches with chicken or grilled vegetables. Per Serving: 569 calories; 37g fat; 48.6g carbohydrates; 15g protein; 11mg cholesterol; 781mg sodium. I HATE beets, so I was really wary when I tried this dish. The beets are really mild in the pesto though, so it didn't bother me at all. It came out so pretty that it's totally worth making, even for beet-haters like me. cheesy and garlic-y music to my ears! using the beets in the pesto was a fun way to spice up a classic and plate something that looks special. The zucchini squash side was also tasty, quick and easy. Who would of thought beet pesto pasta would turn out to be amazing! I just couldn't resist making the dish even though I'm not a fan of beets. Definitely would make more in the future. Also what caught my eye was color of the pasta, which was pretty cool. To make this recipe vegan, I did nutritional yeast flakes instead of grated parmesan. Toasting the pine nuts also made a huge difference, I don't know why I had not tried that before!